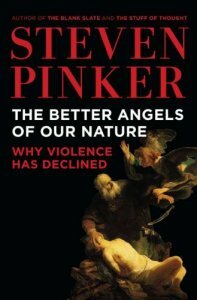 This is Steven Pinker’s big 2011 book, The Better Angels of Our Nature: Why Violence Has Declined, that takes a long-range view of human history to show that the human condition, over millennia and especially in recent centuries and decades, has vastly improved in terms of the reduced likelihood of any person dying of violence. I’ve dipped into this book before, including some quotes of its brief discussion of violence in the Bible — in this blog post (scroll down). And it’s gotten huge plugs from the likes of Mark Zuckerberg and Bill Gates (e.g., http://time.com/money/4780337/bill-gates-book-recommendation-better-angels-steven-pinker/, among many other links). There’s a long Wikipedia page, which I’m not looking too closely at before reading the book for myself. Here’s my take on the first 8 pages– the preface. 6. In the postwar era, a ‘growing revulsion against aggression on smaller scales, including violence against ethnic minorities, women, children, homosexuals, and animals.’ The Rights Revolution. This is a big book that will take me a while to work my way through. It’s been on my to-read shelf for years. I’m finally motivated to take it on, with the news that Pinker has a new book on the way, one that is sort of a sequel to this one: Enlightenment Now: The Case for Reason, Science, Humanism, and Progress, due next February (https://www.amazon.com/Enlightenment-Now-Science-Humanism-Progress/dp/0525427570/). This entry was posted in Book Notes, Culture, Evolution, Human Progress, Humanism, Steven Pinker. Bookmark the permalink.